Bramble Cottage is a modern, bright and spacious very comfortably appointed 3 bedroom property in the village of Strontian. Exceptionally popular with repeat visitors and extensively extended to a very high standard for 2019 to include upstairs space. Lounge - welcoming and relaxing, with views towards Loch Sunart, TV, DVD, Amazon Firestick gives access to Amazon Prime Content along with Netflix, and catch up TV apps. CD player. Kitchen - spacious with seating for 6, full size fridge/freezer, oven, hob, microwave, dishwasher, slow cooker - plenty of cook wear and sharp knifes for the cooks! Patio door to side patio, leading to enclosed lawned garden. Bedroom one - handmade king sized bed with added comfort of memory foam mattress, 100% cotton bedding, full wardrobe, dressing table, hair drier. Bedroom two - spacious with handmade twin beds, 100% cotton bedding, full wardrobe, drawers, selection of books and games for all guests young and old. Bathroom - full sized bath, washing basin, toilet, separate shower cubicle, heated towel rail. Finished with handmade shelving and comfort disability rail. Newly converted upstairs now added to the house, implementing the unique style of Scottish cabinet maker Euan Cuthbert. Euan has a passion for Scottish hard woods and has prioritised comfort, space and light in his vision for Bramble. This is our much loved holiday home and we have really invested our passion in creating a warm and welcoming environment to enjoy year after year. Second Lounge:- Wander up the hand made oak stairs, made from local wood, to enter the open plan spacious and relaxing lounge. You wont find a second TV here(!) - this space is for relaxing, unwinding and spending time together. Perhaps read a book or watch the diverse range of birds through the patio doors in the surrounding trees. 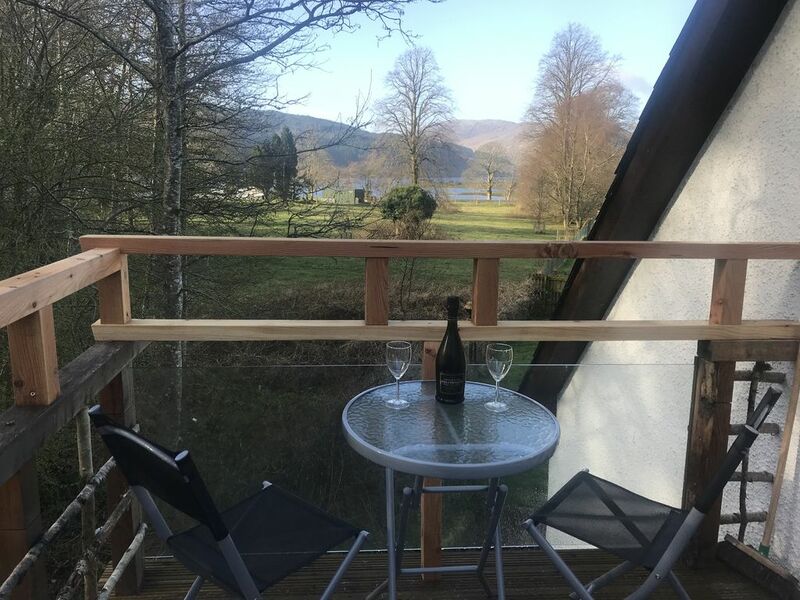 Why not enjoy a glass of wine on the balcony whilst taking in the views of Loch Sunart. Garden - Enclosed large, flat sunny garden with seating area. Large drying shed - 11metres x 2.5 metres - plenty of space for bikes, kayaks and walking equipment! Fire pit for those who love natures TV with garden enclosure to protect you from the local breeze! The cottage looks towards beautiful Loch Sunart - a few minutes walk away and an ideal spot for kayakers and sailors alike. Fishing is also popular in the village and local permits are available at the shop. Strontian is the perfect hub for walkers and nature lovers wishing to explore the many local paths and mountain trails of the area known as the Outdoor Capital of the UK. You may be happy with the walks from the door, and there really is no need to venture far to enjoy the scenery and tranquility, not to mention the wildlife, but it would be a shame to miss out on some of what the area has to offer. The village has invested in a new pathway this year making it easier to get to the beach. Walks through the Sunart Oakwood forest are also very enjoyable. Visits to Mull and Iona via the nearby Lochaline ferry or Skye via Mallaig are very enjoyable day trips. The majestic mountains of Glencoe or bustling Fort William can be reached within 45 minutes via a short crossing on the Corran Ferry. Why not climb Ben Nevis - Britains highest mountain, while here? Or simply enjoy the Stunning sandy beaches and secluded spots of Sanna, within easy reach on the Ardnamurchan peninsula whilst Ardnamurchan Point itself, with its dramatic views out to the Hebrides, is the most westerly part of the British mainland. Enjoy lunch at Ardurmuchan Lighthouse - Britains most westerly point. The majestic scenery of the West Highland Line can be experienced by train from nearby Fort William, giving visitors the opportunity to see the world-famous Glenfinnan Viaduct at the head of Loch Shiel. Whatever you choose to do, you will look forward to returning to Bramble Cottage, perhaps preparing a meal in the kitchen to enjoy al-fresco in the garden, or simply relaxing with a good book in one of the lounges before taking a short stroll to the local hotel for a meal. Forgotten a key ingredient or pint of milk? Don't worry - there are 2 well stocked shops within 5 minutes stroll! The cottage has been designed for both couples, friends and families in mind and we have many return guests each year from each group. The upstairs area would be perfect for a second couple or for families keen to bring the grand parents and ensure everyone has space. The additional en-suite will save queues in the morning! The ground floor is wheel chair friendly, with flat entrance, wide doors and lower wall switches. If you have mobility issues you have no need to go upstairs. The cottage offers a selection of books and DVDs for those wet afternoons and there are board games to bring the whole family together! An Amazon firestick gives access to Netflix and Amazon Prime, along with all the usual BBC iPlayer/ STV Player content. At bramble you can do as much - or as little! - as you want. We hope you enjoy it as much as we and all previous guests do. Many of our guests tell us it the best holiday cottage they have ever stayed in - which explains why so many return year after year! We bought this property as we recognised Strontian as being in the perfect location for a varied family holiday. We can get to the beaches of Sanna, the hills of Glencoe, the picturesque Island of Mull or Fort William in an hour, or we can take a walk through ancient oak lands or by Loch Sunart straight from the door. When we viewed the cottage it was obvious the previous owners had invested great love and attention in the cottage having only built it 5 years previously. It had a warmth and welcoming feel that felt like coming home. Previous visitors in the visitors book all spoke of their love for Bramble and their desire to return. The cottage has a shop, cafe and hotel within a few minutes walk and we liked the benefit of being "away from it all" but with convenience on the door step. All locals have been friendly and the small town has a real community feel that is missing in today's busier towns. We love getting off the Corran Ferry on the peninsula, feeling our modern day stresses melt away safe in the knowledge that in 20 minutes we will be Enjoying the peace and warmth of Bramble Cottage. The cottage is rarely empty - if we don’t have guests staying we will be there ( more often than not looking for more ways to improve it for the following year!). But every day starts with a walk to the shore to see the loch and reconnect with the peace and beauty of the area. Bramble Cottage is set in an ideal situation. It is only metres away from all local amenities but has no passing traffic. It offers privacy with a fenced front garden and has enclosed, flat gardens to the rear - so perfect for children or pets. It is situated on the edge of a woodland offering fantastic walks. It is in the ideal location to enjoy a varied holiday, with majestic Glencoe, the scenic Island of Mull, the glorious sandy beaches of Sanna all within an hour, or fabulous walks from the door. The cottage has generously proportioned rooms and is wheel chair friendly ground floor. We aim to provide a home from home that you will want to return to again and again. We try to take the stress out by providing quality linens, towels, kitchen basics such as washing up liquid, a complimentary welcome pack with fresh milk in the fridge. We hope you will love Bramble as we do! Why choose Bramble? Its a unique and much loved property where we invest our heart and soul into making it as good as it can be. Euan is a Scottish cabinet maker and has really brought the house to life, giving it unique character with stylish use of Scottish hardwoods. Many of the furnishings are hand made to traditional methods by Euan. Liz has focussed on comfort and tranquility with quality soft furnishings in relaxing shades. Nevis Range near Fort William and Glencoe Mountain Resort are both within 45 minutes by car. Both centres offer a full range of equipment hire and tuition packages. "Let Britain's only mountain gondola transport you effortlessly to 650m" www.nevisrange.co.uk "Visit the original & best ski area in Scotland! Ski and Snowboard across 19 runs and 7 lifts - catering for skiers and boarders of all levels. Complete beginners can enjoy the gentle plateau runs while experts can experience the incredible variety of terrain. (Which includes the longest and steepest runs in Scotland)"
Flat drive to property. Access to the cottage is via flat paved area. All doorways inside are wide. Low lightswitches and high sockets have been provided. Full access to front and rear gardens. Notes on accommodation: The cottage features many unique hand made furniture pieces. It has oil-fired central heating and all electricity is included in the rental price. 100% cotton linens included with beds made up for arrival. Welcome basket featuring Scottish treats. The cottage is non-smoking. Dogs are accepted, by arrangement, but we ask that they are kept off the furniture and out of the bedrooms. Outside: Grass front and wildflower rear gardens. Table, seating and barbecue area in large front garden. The front of the property is enclosed, providing seclusion and privacy for guests. There is a patio area to the side of the cottage which can be accessed by double doors from the dining kitchen. Cleaning / Towels / Linen / Maid service: All towels and linen are included and changed on a weekly basis. Property cleaned to 5* review standard between lets. Other: Large and spacious hallway with utility cupboard, patio area outside kitchen accessed by patio doors. Nice place to stay,clean and comfortable. Cottage is in a very quiet location,you can walk straight out of the front door and straight into a wooded area and up into the hills. Nicely decorated inside with a large kitchen and decent sized bathroom.bedrooms are nice as is lounge with good views of the hills. Lovely week in Bramble cottage. Very peaceful little spot at the end of a quiet lane and ideal position for exploring this area of Scotland. Cottage very clean and comfortable, the owners of the cottage provide everything you can think of and even made a journey to the cottage to assist us, thank you again Liz. Would definitely recommend and return. Scotland.We have travelled far and wide and rarely go back to the same place. We would love to go back to Bramble Cottage. Thanks to the owners for a brilliant time. Thank you for your lovely review and we look forward to welcoming you back next year! Lovely cottage to stay at. Lots of walking, cycling within the area of Strontian. Beautiful, comfortable cottage in perfect surroundings. Bramble cottage was perfect - clean, comfortable and spacious with everything we needed including lots of games - Frustration was s big hit with our youngest! Although the weather wasn’t kind, we enjoyed woodland walks from the door and using the fire pit. Great coffee and cake (and tasty Friday take away) from Sunart cafe. The Loch is beautiful and we enjoyed wildlife spotting. A lovely break in a fabulous setting! Thank you very much for your kind comments. We hope to welcome you back in the future! We were very lucky with the weather, two weeks sun and no rain at all! But apart from that the cottage is lovely, homely and comfortable. A little shop nearby and brilliant walks from the door for us and the dog! Perfect! Loch Sunart is within a few minutes walk. At 31 kilometres (20 miles) it is the longest sea loch in the Highlands and a popular destination for kayakers, canoeists and sailors. Lochaline - for ferry to Mull and onward trips to Iona and Staff - is a picturesque 30 minute drive on the A884. There is a well-resourced community centre with a library which is open 6 days a week including two evenings. The centre also provides community sports facilities including a gym and badminton courts. There is a cash machine in the mini-market in the village centre. Booking Notes: £100 deposit on booking with balance payable 6 weeks before arrival. Supplement for use of Master Bedroom with En-suite and roll top bath - £100. Please confirm when booking if you wish this included (we recommend it!) Changeover Day: Preferred changeover is Saturday but we can be flexible, please ask. Notes on prices: Prices negotiable for longer stays or short breaks in winter. Off season Monday-Friday specials available at a discount Strictly no smoking policy Pets welcome but please keep out of bedrooms and off furniture The cottage should be fully clean on arrival. Please leave in the condition you find it in Linens and towels provided with beds made up for arrival, please remove any used bedding, fold, and leave with any used towels on the kitchen table on departure. Breakages should be paid for. If anything is not working during your stay please contact our local property manager, Hayley McPhail. We want you to enjoy your holiday and recommend us to others - if you have any suggestions for improvement please let us know!